Spencer Family in Concert, Tonight! The Spencer Family is coming back to FSBC for a free concert this evening at 6:00. Hear some beautiful hymns, praise and worship songs, and original choruses from this talented family of musicians. Our address is 1220 W. 8th St. Here is their rendition of Come Thou Fount! Good morning, everyone! This morning we have our Easter breakfast at 9:30 in the fellowship hall downstairs. Come for pancakes, eggs, hashbrowns, biscuits and gravy, donuts, coffee, and more! The breakfast is free. Then at 10:30 we will have our worship service with a sermon from Pastor Gabe about understanding the meaning of the resurrection. "If you have been raised with Christ, seek the things that are above, where Christ is, seated at the right hand of God" (Colossians 3:1). From Palm Sunday to Easter Sunday, we will have evening worship each night starting at 6:00. Join us for singing, prayer, and teaching from the word of God. Services will wrap up before 7:00. The devotional each evening will correspond with what Jesus did during that week leading up to His death on the cross and resurrection from the grave. In our Thursday evening service, we will share together in the Lord's Supper. 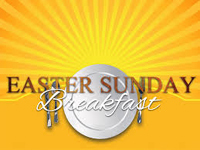 On Easter Sunday, we will join in the fellowship hall for breakfast starting at 9:30. Our worship service will still be at the usual time at 10:30. Please come and join us!